Paradise Air Inc is proud to serve the Sachse community! About Sachse, TX - Happy to be your hometown Heating & Air Conditioning Contractor! Sachse is a northern Dallas, Texas suburb located in portions of Collin and Dallas Counties. As of 2010, the population of this community had exceeded 20,000 residents. The community was founded in 1845 by Prussian immigrant William Sachse, who developed the county’s first cotton gins and mills. Currently, the community is attempting to revitalize and restore old buildings from this time period. Residents of Sachse enjoy mild to warm winter months, but summers can be brutal. Due to this community’s location in the Sun Belt, the summer months are quite hot and very humid. 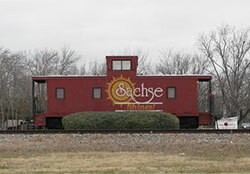 Sachse is a primarily residential community, so there aren’t many attractions located here. There are some shopping destinations that may be of interest to visitors and residents, including Kroger, a Walgreens, and Lizzie Bee’s Flower Shop. Larger shopping areas are located in Garland at the Firewheel Town Center or in Wylie at stores like Super Target. Garland is also home to large-scale attractions that draw in many of Sachse’s residents, including the Hawaiian Falls Adventure Park and Firewheel Golf Park.